Zeal Optics are reinventing themselves. It's time to relearn anything you thought you knew. Now owned by high-end, independent sunglass maker Maui Jim (third in sales behind Luxotica brands Ray-Ban and Oakley) the brand was rebuilt by snowboard industry vet and new Director of Marketing, Joe Prebich (who came over from Oakley). This is a good time for me to get familiar with Zeal because I didn't know anything about them in the first place. They sent me a couple pairs of goggles from the new 2013 line to demo and return. Here's my take on the Slate. That's right, in a stroke of genius Zeal made the inner foam liner detachable from the rest of the frame. Now, when you wear out the foam, all you have to do is replace a $20 part and you're back in action. The final pricing for that isn't set just yet, but it'll be cheaper than the frames, that's for sure (MSRP of $149). Now if they could make the upper foam as easy to replace, they'd have me for life. How about the looks? I got the black frames with white strap. Black logo and name hits adorn the strap, along with a reversible leather and plaid snap-on piece of flair. They've got a half dozen colorways, all classic looks, nothing flashy. They worked great with my huge helmet and even have strap to spare. Like most new goggles they have the rubberized strap to keep it stuck to your bucket. I'd say these goggles are for a medium-sized face. My XL noggin would like something a little huskier. Goggles are all about personal preference. If you like a lens with gradient, check these out. If you need a giant, flashy fishbowl, look elsewhere. That said, peripheral vision, optics and comfort are all good. Nothing to really blow you away, but with the replaceable foam liner, they might be your go-to frame for years to come. 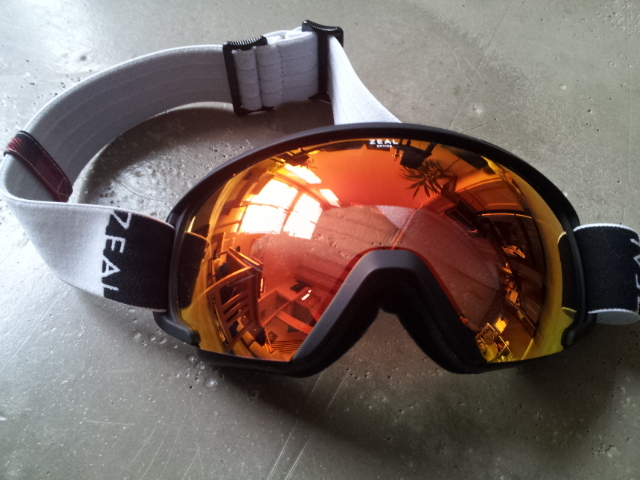 Also, lookout for Zeal's techy Z3 and Ion goggles with heads-up display and built-in video respectively. Finally, some serious Jetsons tech in a goggle! tried the Slate. The optics are stellar - best I've ever seen (better than Smith). Other than the tint, it was more like I was looking out of the frame without any lens. However, I couldn't see any change in the auto lens...took it outside in the sun, did the old pull it out from the dark to the bright light trick, everything and no change. The Slate fit my medium face and big/long, caucasian nose perfect. The side peripheral is great...but, down view, not so much. I really didn't like the styling since I kinda looked like I was wearing womens cat eye glasses from the 50s. On a side note, Zeal needs to get a better webmaster. The drop-down menus deliver very limited results, there's typos, confusing/missing info and, even worse, all the models (no matter what type of lens) are shown with a mirror lens. I ordered the automatic lens, since the site shows it with a mirror, only to receive a standard translucent amber tint lens. Thanks for the comment, though I don't think I can agree with the 'best ever optics' assessment. It might be just that they didn't fit my face well. Their Voyageur model was even better. Stay tuned for the review on that later. Women's cat eye glasses from the 50s? I can kinda see it, but it's a stretch of the imagination. I would like to test some of those automatic lenses, too. Not to mention the heads-up display some of their other models have. Sweet! Thanks! And can u put a post on how you would go about changing them? The Slate has a simple 'peel the frame away from the lens' system. 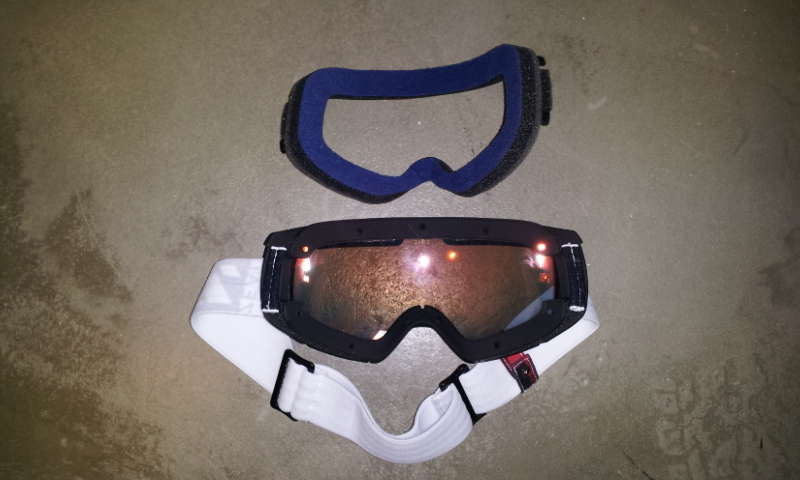 Check out this youtube tutorial of a goggle with a similar style. It can be daunting the first time, but don't sweat it. The only part you could possibly mess up is the upper foam venting.